George Graham Reviews Arnold McCuller's "Soon As I Get Paid"
While the pop music world has plenty of stars -- those household names who are heard on the commercial media -- the music world is full of supporting artists. They are the session players whose work is frequently heard, but who are little-known except to those who spend time reading the credits on CDs. Occasionally, one of the supporting players will come out with a solo recording -- and more often than not, it's the guitar player who will do a solo album which is usually demonstrative of that player's versatility. Less frequent are solo recordings by the background vocalists who often lend their voices to the recordings of popular solo artists. This week we have an excellent example: a new CD by a voice frequently heard but whose name is little known. It's Arnold McCuller, whose new release is called Soon As I Get Paid. McCuller has been heard on recordings and/or stage performances by Phil Collins, Bonnie Raitt, Beck, Todd Rundgren, Lyle Lovett -- as a member of Lovett's Large Band, Linda Ronstadt, Bette Midler and Aretha Franklin, to name a few. He is probably best known for his 30-year association with James Taylor, where he is often featured on the stage performances of Taylor's song Shower the People. He was part of the 2010 Troubadour Reunion tour with Taylor and Carole King. Arnold McCuller grew up in Cleveland and, not surprisingly, his early musical background was singing in church, where both his parents were active vocalists. His first major gig was in the national touring company of the musical Hair, and then became part of a soul-styled quartet called Revelation who toured with the BeeGees. In addition to his work as a backing vocalist, he has been appearing in films since 1979, starting with The Warriors, and more recently in The Sum of All Fears, where his voice became the singing voice for a character. Despite his role primarily as a supporting musician, Soon As I Get Paid is in fact McCuller's eighth album, or ninth if one counts the soundtrack to Hairspray in 2007 on which he was featured. His first release was in 1984 with keyboard man David Benoit. With McCuller hanging out with world-class musicians for as long has he has, his new CD is, not unexpectedly, a class act. His surprisingly light, but buttery tenor is soulful but understated. His CD is one that achieves its impact through its subtlety and depth. Recorded over just five days in January and February of 2011, the material includes an interesting mix of originals, plus songs from composers ranging from bluesman J.B. Lenoir, to John Hiatt, to contemporary country writers Buddy and Julie Miller. He is joined by some excellent players, including jazz keyboard man Larry Goldings, David Hidalgo of Los Lobos on guitar, along with Mike Landau and David Kalish; Jess Young on additional keyboards, Jimmy Johnson on bass and Gary Novak on drums, most of them first-call studio musicians. McCuller co-produced this fan-funded CD with guitarist Kalish. 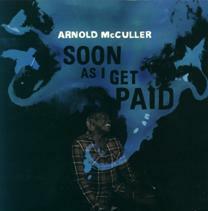 Arnold McCuller's new CD Soon As I Get Paid is an outstanding recording by one of those relatively unknown but often-heard backing vocalists. His style is an interesting admixture that would almost seem to be a contradiction: laid-back soul, blues and venerable R&B, whose performances rely on subtlety that can make the music powerful without being loud, soulful without being cliche-ridden or too sweet, all centered around McCuller's vocals which have all those qualities. No wonder he is in such demand as a backing vocalist for all the well-known artists with whom he is associated. And his band this CD are also world class. I'll give Soons As I Get Paid a rare grade "A" for its audio quality. The mix is as understated as the music, with a clean, open sound, almost no electronic effects, and no attempt to dumb down the audio to give a retro feel. Also the dynamic range is also better than average with very little obvious volume compression used. It reminds me of the sound of Lyle Lovett's CDs, on which McCullers had often appeared. The soul sounds of the 1960s and 1970s has been one of the many styles that contemporary artists have been doing as part of the burgeoning retro movement. Arnold McCuller is the real thing, following his own 21st Century musical path, and coming up with one of the most enjoyable soul revival albums in a long time, one that just keeps getting better the more you hear it.